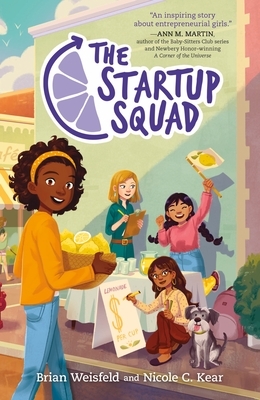 Girls mean business in a brand-new middle grade series about friendship and entrepreneurship! All the great leaders had to start somewhere. And Theresa (“Resa” for short) is starting with the lemonade stand competition her teacher assigned to the class—but making it a success is going to be a lot harder than Resa thinks. The back of each book features tips from the Startup Squad and an inspirational profile of a girl entrepreneur! Brian Weisfeld has been building businesses his entire life. In elementary school, he bought 100 pounds of gummy bears and hired his friends to sell them. As a teen, he made and sold mix tapes (ask your parents what that is), sorted baseball cards (he got paid in cards), babysat four-days-a-week after school, and sold nuts and dried fruit (and more gummy bears) in a neighborhood store. As an adult, Brian helped build a number of well-known billion-dollar companies including IMAX and Coupons.com. Brian is the Founder and Chief Squad Officer of The Startup Squad, a multi-platform brand dedicated to helping girls reach their potential, no matter where their passions lie. Brian lives in Silicon Valley and can often be found eating gummy bears with his wife while watching his two daughters sell lemonade from the end of their driveway. Nicole C. Kear is a parenting writer who contributes essays and articles to Parents, American Baby, Babble and Salon, among others. A native of New York, she received a BA from Yale, a MA from Columbia, and a red nose from the San Francisco School of Circus Arts. She lives in Brooklyn with her husband, three children and a morbidly obese goldfish. Now I See You is her debut work.